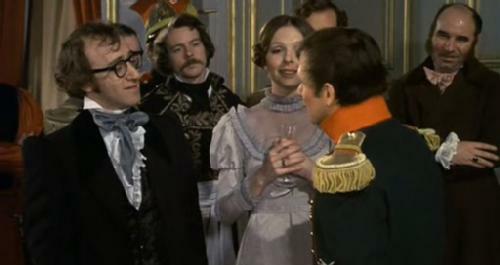 Woody Allen (Blue Jasmine) takes on the monolith of Russian literature—with a bit of Ingmar Bergman thrown in for good measure—with 1975’s Love and Death, a deadpan costume comedy epic set against the sweeping backdrop of the Napoleonic Wars. Allen plays Boris, a philosophical coward who becomes an inadvertent war hero and then a potential assassin thanks to the encouragement of his mad(cap) wife, Sonja (Diane Keaton, Morning Glory). Shot by the great cinematographer Ghislain Cloquet (Tess), the movie features a brilliant turn by James Tolkan (Top Gun) as the great Napoleon, who insists to his royal chefs that if a pastry is going to be named after him, it must have more cream and no raisins!